Maintaining your CPAP equipment clean and sanitized will ensure the proper functioning of your machine and accessories for very long years. Typically, when you purchase CPAP equipment, the user manual will contain special instructions on cleaning CPAP mask, the tubes or the device itself. Clean and sanitized CPAP equipment will also help you ensure you are receiving quality air therapy with each session. Proper maintenance of your air treatment device is of primordial importance, to avoid illnesses and infections. What can happen if your CPAP is not clean? Mold can cause nasal stuffiness, throat irritation, coughing, eye and skin irritations. 1. Always make sure to unplug your CPAP from the power outlet before starting the sanitation process. Electrocuting yourself is one of the risks when trying to clean an electrical device with water. Never immerse your device in water, even if unplugged! 2. Dismantle the machine: detach the mask from the tubing system, remove the headgear, and also remove the CPAP tubes from the power outlet. Next, remove the humidifier and the water chamber. Check your user manual to see how to disassemble your CPAP equipment properly. Make sure you follow all the instructions. 3. Start cleaning your gear using a soft wet cloth. If you wish, you can add some gentle baby shampoo or sensitive dish soap to the water. For better disinfection, some users prefer using a mixture of water and vinegar to cleanse their CPAP equipment. However, for even more professional results you should use an automated sanitizer such as the SoClean CPAP cleaner. 4. 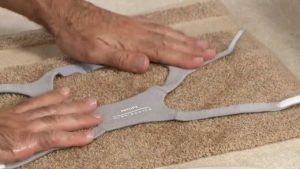 Thoroughly wipe the parts and accessories of your equipment with the damp cloth, making sure to change the water at least once during the procedure. 5. Soak the heated tubing, mask, and headgear in warm water, and allow soaking for approximately half an hour. It is crucial to allow these accessories to air dry before you can use them again. If you don’t let them dry properly the risks of accumulating mold are much higher. Repeat the cleaning procedure once a week. 6. Check the CPAP machine filters if your machine has such components. Some devices come with reusable filters that can be cleaned (washed) and then reassembled again. Other devices will require that you replace the old filters at last once a month. Again, check the user manual to see manufacturer’s instructions regarding cleaning and maintenance of these filters. 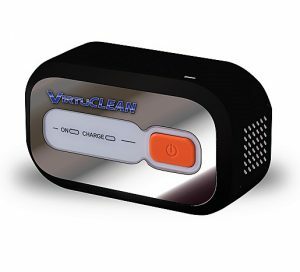 In 2017 Virtuox announced their new CPAP cleaning machine called the Virtuclean. This little machine is great for people who want to have a clean CPAP while traveling. It’s very easy to use and not only it fits in any suitcase but is also quite affordable. It’s ultra quiet and charges in less than two hours. The cleaning cycle is only 30 minutes. Unlike other CPAP cleaners, the Virtuox doesn’t require maintenance and parts changing. It has an 18-month guarantee and a battery life of 10 years. It’s a really helpful cleaning machine for people who don’t have the time for a thorough cleaning process. However, ozone can be harmful to people who have high-ozone sensitivity. That’s why you have to use it in open and well-ventilated areas. 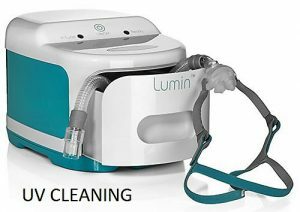 The Lumin CPAP and mask cleaner is another great machine that uses UV light instead of ozone to clean your CPAP. It was first released in February 2018 and has gotten nothing but positive user reviews. The manufacturer claims that it can kill 99% of bacteria just as well as the Virtuclean. It can disinfect the CPAP in only 5 minutes. The best thing about this machine is that it’s suitable for disinfecting other items as well. You can clean cell phones, kid’s toys, and other accessories. The compact design really helps as it doesn’t take a lot of space in your home. Unlike the Virtuclean, the Lumin doesn’t use ozone and is much safer for the user. It even turns the light off when you open the drawer. This is done to protect your eyes from the UV light. Experts advise that users should clean their CPAP equipment at regular intervals (minimum once a week). However, if you are down with the flu or any other respiratory disease, you should clean your machine every single day to remove properly any potential discharges or residues from the tubing and mask. To reduce condensation properly, you should use a heated tubing and humidifier system. It is also advisable to use only distilled water with your system, to avoid any infection risks. Replace your mask at 3 to 4 months, and pay attention to replacing all spare parts regularly such as the air filters. Never operate your CPAP device with used masks or tubing systems, but ensure to purchase new ones each time it is required. Also stay away at all costs from sharing your equipment, as this increases substantially the risk of infections. The CPAP cleaning wipes help you maintain your CPAP device clean and hygienic. Famous manufacturers such as ResMed offer cleaning wipes that allow for a convenient way to keep your CPAP clean on a daily basis. Use these wipes to remove the facial oils build up from the mask cushion. The cleaning wipes will gently yet effectively remove any dirt and residues from the cushion, and this, in turn, helps to optimize the mask seal. 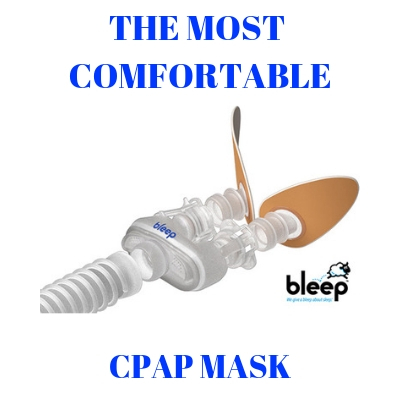 When a CPAP mask has facial oil buildup on it, this will not seal properly which means your air therapy might be compromised. High-quality CPAP cleaning wipes are made from pure cotton, and they do not contain any fragranced ingredients, latex or alcohol. The wipes are infused with a gentle cleansing lotion and natural deodorant such as Aloe Vera extract. The Control III Disinfectant Germicide is an EPA approved cleaning solution that can greatly help with cleaning your CPAP and accessories. Once you have created the diluted solution it can be re-used for up to 14 days. This makes the Control III extremely cost-effective. It has a very pleasant odor and it doesn’t irritate the skin. The Control III has a low environmental impact and is easier to use than alcohol or other alcohol-based solutions. You can find plenty CPAP cleaning supplies to keep your machine clean and sanitized on a regular basis. There is the tube cleaning system which helps to keep your tubing free of mold and bacteria. 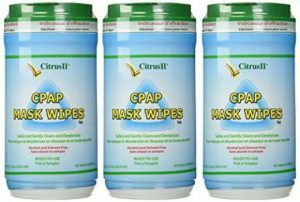 There are also many citrus, or natural extract infused gentle CPAP detergents available which help you perform cleaning of your device in a professional way right at home. The CPAP tube cleaning wands and brushes are also efficient, allowing you to clean the inside of your tube in easy steps. Especially if you use a humidifier for your treatment, you must properly care for your device. Look for supplies and accessories that allow you to clean your device quickly and comfortably. At times, you might find it tiresome to disassemble your equipment and bathe every single part separately in soapy water. Then, you must allow everything to air dry before you can actually use the system again. This is why investing in an automated CPAP sanitizer might be a truly efficient solution because it allows you to clean your device without having to take apart the machine. Remember that keeping your CPAP machine clean will ensure that it will work much longer and it will not compromise your oxygen therapy. The SoClean 2 is a great machine for those who do not want the mess of cleaning their CPAP machine and parts with soap and water or white vinegar and water. The SoClean 2 makes cleaning your CPAP equipment an easy job and does not use any water or other chemicals. We currently sell the SOClean for $299.00 and you may order it on our site: https://www.SleepRestfully.com or by call us toll free at (866) 923-2727. I have a SoClean quit sanitizing 6 months after I paid hundreds of dollars for the China crap. The SoClean is a great device. It is the ONLY automatic CPAP cleaner on the market and does not use water or detergents. It should work just fine on your CPAP made in China. Personally I would avoid any CPAP machine that is not manufactured in the US. Wayne said that the SoClean quit sanitizing after 6 months not his CPAP. Is the SoClean made in China? Yes the SoClean 2 is made in China. However, the SoClean 2 has a one year warranty and if the company you purchased it from will not honor it I would suggest that you contact SoClean directly. You might also look at the newest CPAP cleaner to come on the Market. The VirtuCLEAN is a great product and significantly smaller than the SoClean making it perfect for use when traveling as well as at home. Not true. There are MANY cleaners on the market that do not use soap or water. I.E. Sleep8, Moocoo, Lumin etc. You are absolutely correct. However, when that was written in 2017 the SoClean2 WAS the ONLY CPAP cleaner on the market. Since then we have seen the Virtuclea Lumin and Sleep8 come to market. The ozone that this machine uses to disinfect will degrade the cpap device over time. I really would love to see the science to back up your statement as I cannot disagree with you more. There are legit but they are not worth the cost. Ozone is not good for your equipment it breaks down the plastics in your machine . … CPAP cleaning machines that I know of produce ozone/O3/activated oxygen to kill throughout the humidifier, tubing, mask and possibly the pump. My Mom is in the 2nd week trial of SoClean. She said it smells…is that normal? There is a slight smell. If it causes her an discomfort I would suggest she turned on her CPAP a few minutes after cleaning and let the ozone blow out more. Could you please cite a reference to substantiate your claim that ozone will degrade the CPAP device over time? Thank you. I have never heard of it and could not find anything about it on the internet. I have a full face mask. The so clean machine is not large enough for the mask to fit. Do you have a larger machine. ? The best mask cleaner: Johnsons & Johnson’s baby shampoo. I use it sparingly and I use it with a tube brush for the tubing. Yes, keep your mask clean but don’t over-clean it either. Too much cleanings removes the oils in the softened mask and makes it brittle – wear out sooner. The SoClean 2 is a fantastic cleaning option, which you should use everyday. However, you absolutely must periodically wash the hose and mask assembly to remove oils and other particulate matter. 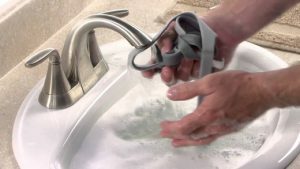 I wash mine once a week, using a cheap anti-microbial hand soap, allowing the hose and mask to soak in the soapy water for 15 minutes or more. Then hang it up to air dry. I’ve been doing this for 3 years now (since I purchased my SoClean) and have had no upper respiratory or sinus infections. Works well for me. I’ve had my machine 4 or 5 months now. Today it is not working. The message on the screen says “no hose detected” but the mask with hose is correctly contained. I have tried several times to reset, or reprogram time but still get the same messAge. I should have a vALid warranty, right? Can anyone help me troubleshoot this problem? You need to call the company you purchased it from as there is a 12 month warranty on the SoClean 2. They will be able to switch out the unit. Have you tried to replace the small one way valve filter? The manufacturer recommends replacement every 6 months but mine only lasted about 5. I gues it depends how often you use it. Absolutely it does depend on how often you use it. The 6 month time frame is just an estimate. The machine will tell you when it is time to get a new filter. How do the SoClean 2 and the new VirtuCLEAN compare to each other besides one being smaller than the other? Please see the reply above. Thank you. I would also like to know how the SoCLean2 compares with the VirtuClean. The VirtuCLEAN does not require any disposables be purchase such as the 6 month filter and check valve. Please remember that the filter is only used to absorb some of the ozone smell it performs no other function. In addition the VirtuCLEAN is easy to travel with and uses a lithium ion batter so no electrical outlet is needed. The larges difference is the cleaning process. The SOClean uses a 7 minute cycle which is very loud and then the product must remain inside for an additional 2 hours. The VirtuCLean is a silent 35 minute cycle and you are done. There are many other reasons we line the VirtuCLEAN but this should help you. I use Full face mask. I spray it with Lysol disinfectant spray and wipe it clean. In a plastic tub add Johnsons baby shampoo warm water. I put my tube and water tub in the tub. Thoroughly, rinse and wash. The plastic tub I use it the one I got at the hospital stay once. Where is the VirtuClean manufactured? How many uses between battery charges? Is there a DC/AC adapter so that one does not rely on the battery when at home? 1. The VirtuCLEAN is manufactured in China. 2. You should get about 8 uses between battery charges. 3. When at home we do suggest that you continue to use the battery however you are able to plug the VirtuCLEAN directly into the 120 volt wall plug or into any USB port. So bottom line is you can use AC/DC power to run your VirtuCLEAN. Seems you have researched the cleaners well. I like and recommend the VirtuCLEAN. You can clean the hose with the VirtuCLEAN. I am not sure why you think you cannot. I thought the Virtuclean used some kind of light not an ozone cleaner. Am I correct about that? What I read was that if your hose is colored, like mine is black, the light won’t penetrate it and clean it. That is what my understandinng is. The VirtuCLEAN CPAP Sanitizer uses Ozones to clean. You are confusing it with the Lumin which used UV light. The Virtuclean will clean the hose. It is the Lumin that will not at the present time however they are releasing the Bullet in the coming days to clean the hose. I ORDERED THE $99 CPAP CLEANER LAST WEEK AND CANNOT CALL THEM THEIR MAILBOX IS FULL AND THERE IS NO SHIPPING INFORMATION I GOT A NUMBER BUT IT DOESN’T MATCH ANY SHIPPER. I am sorry to say that this is a perfect example of you getting what you paid for. There is NO CPAP Cleaner on the market at a price point of $99.00. It is obviously a scam or an inferior product. My suggestion is for you to stop the charge today and call SleepRestfully.com toll free at (866) 923-2727 and order the real thing with quick shipping. I take it the machine itself is not cleaned, just the hose, humidifier canister and mask. Shouldn’t the air intake and all of the areas within the machine where the air touches be cleaned as well? There is no way to clean the inside of a CPAP machine. The VirtuCLEAN and SoClean 2 will clean any part of the machine that air touches. Does the VirtuClean emit any ozone into the air? Yes it does, there no no way that ozone cannot be emitted into the air by any CPAP sanitizer. The VirtuCLEAN uses ozone to clean the equipment where the Lumin uses UV light. Absolutely, You place the humidifier chamber in the machine just like you do the mask. I travel to countries that have 50 cycle 120 V. Will the VIRTU Clean work there? Yes the VirtuCLEAN can be used and charged any where in the world. The Lumin CPAP Sanitizer is not necessarily better that the SoClean 2. It just cleans using a different principal. The lumin uses UV light to clean the mask, humidifier, etc where the SoClean 2 uses ozone to clean the CPAP mask and supplies. I am researching cpap cleaning machines (So Clean, Virtu Clean….) for my husband. Do you recommend any particular machine? We highly recommend the VirtuCLEAN machine. Because of it’s size and battery pack we believe it wll be used more than other machines on the market. I was told by my respiratory therapist, NEVER to use So Clean or anything like it because it will void the Equipment’s warranty. Why? That is not true. It WILL NOT void any warranty on the machine. I work in a nursing home. Can one machine be used to clean multiple CPAPs? Yes, you can use this on more than one CPAP machine. I have the airsense 10 with the heated hose. I do not see anything about connecting the headed hose to the virtuclean. All videos I have seen show a regular hose. Can the heated hose be connected with the virtuclean I assume there is no problem with the other that the mask goes inside. I’m researching cpap cleaners. On some reviews & websites, they say the Lumin will not disinfect the hose. Is this true? it cannot be advertised a sanitizing the hose to the 99,9% level needed. There is new add on product being release this month for the Lumin called the Bullet that will sanitize the hose. Is it not true that properly controlled studies have shown that 1) CPAP use has not shown any evidence of increased risk or prevalence of respiratory illness, 2) all CPAP cleaner manufacturers’ studies were on evidence of disinfection of the CPAP, not on evidence of reduced risk of infection, 3) ozone carries its own health risks, and 4) ultraviolet light kills only what it contacts, not what is hidden from the light? 1. I disagree with your statement. It has been shown that bacteria will form in the hose and humidifier from water droplets remaining and this can pass to the user. 2. You are correct however if you disinfect the equipment then the bacteria cannot pass to the user. 3. I would agree to this however if handled properly you are safe. I would not put the ozone cleaner up to your nose and inhale. 4. Again you are right that is why we say to clean the hose the old fashion way. I am confused! I don’t do well with ozone. Is UV the only other alternative (which may not hit or sanitize all the hose)? Do you have to wash the hose yourself even with a LUMIN or a SO CLEAN”? Help?? I am disabled and its difficult to do. Please advise. Thanks. The Lumin is the only CPAP sanitizer on the market today that does not use ozone. You should clean your hose by hand today however in the next moth the manufacturer of the Lumin have an add on product coming out called the Bullet which will sanitize your hose. Would using the Virtuclean in a closed bathroom, with a typical bathroom exhaust fan running during the cleaning cycle be a sufficient way to deal with the localized ozone output? Does the Virtuclean generate ozone for the entire cycle, or does it evacuate the ozone near the end? I suppose the bathroom fan might need to run for some additional time after the cycle finishes to thoroughly evacuate the room? Personally I would just use the VirtuClean in a well ventilated area and forget the bathroom fan. The VirtuCLEAN blows Ozone for 30 minutes and then blows only fresh air for the 5 remaining minutes of the cycle to clear our any residual ozone. How do these machines work if there is no air circulation to move air through mask, hose and water chamber. But there is air circulating in the case of all the cleaners except the Lumin which works on UV lights. The Ozone cleaners all have air being blown around the through the supplies. What I’m understanding is the Virtuclean has a 2 step process in that you have to clean the mask in 1 35 minute process then you have to do the hose and machine resivore in a 2nd 35 minute process is that right? If so, would it make sense to clean mask one day, then resivore the next and alternate this?? Also, I’ve heard concern raised for pets and Ozone. If my Cpap and Virtuclean were in my bedroom and I shut the bedroom door to keep the pups out, they shouldn’t be effected by any of it anyway correct?? For that matter anyone else as long as their not in the same room? The VirtuCLEAn should be used in a well vented area. I would not put a pet or a person in a CLOSED room with the machine running. I an open area there is not problem. As you said the VirtuCLEAN is a 2 step process. I would run both cycles on the same day because if bacteria is in the unclean part it will spread to the recently cleaned area and you will not be any better off than prior to use the machine. Is there any scientific based evidence that ozone (and in particular the SoClean and VirtuCLEAN) will disinfect the CPAP system adequately? Absolutely there is. Please refer to the follow web link for the scientific study. Can someone please explain to me the difference between the ozone and UV light cleaners? I want to find one that cleans the tubing easily. Thank you. What do yo u know about Respify? I just received an Astral ventilator and was told not to use my So Clean 2 with it? If you were told not to use the SoClean the I would not use any cleaner on the machine. I would stick with the old fashion warm water and vinegar. I have had awful sinuses my entire life (multiple allergies to pollens, foods, etc.). I was diagnosed with sleep apnea in 2009 and purchased a CPAP. Sinus infections soon became a problem (and no…I was not terribly diligent about manually cleaning the CPAP) Saw an ad for the SoClean product on the tube last fall and did a bit of research on the net. Ended up purchasing the VirtuCEAN unit in October 2018 through Amazon. Really liked the product…efficienct, portable, easy to use…. Here comes the bad news…. The unit stopped charging about 2 weeks ago. No problem, right? 18 month warranty just return it to the manufacturer for repair or replacement. Wrong…. Upon contacting VirtuOX I was informed that they could not honor the warranty because it had been purchased through a “third party”. If only I had purchased from Walmart (suggested) or an “authorized” distributor it would have been covered….Additionally I felt the customer support from VirtuOX was wanting…(i.e. sucked). Hard to get ahold of, transferred several times, did not respond to emails, etc. I would therefore caution potential purchasers…at the very least make sure that you purchase this product from an “authorized” distributor. To their credit Amazon was quite helpful and considerate. I was allowed to return the VirtuCLEAN for full credit even though the return window had expired. We try to teach people that most of the sleep therapy equipment and supplies sold on Amazon are from the Gray Market and the manufacturer will not honor the warranty if not purchased from an authorized dealer. But to save a few dollars up front you continue to purchase through Amazon. Let me be VERY CLEAR not one selling Philips Respironics or ResMed products on Amazon or EBay are authorized dealers. Additionally many other sleep product are not by authorized dealers. If you had purchased it from SleepRestfully.com all you would have had to do was to call us and we would have handles the warranty return. Save a few bucks up front and cost yourself later on. As Bullet come out yet for the Lumin? The Bullet is due to be release in the next few days. I am on a Bpap machine and take it that Cpap cleaners clean both with no difference. Absolutely, You may use a cleaner on either a CPAP or a BiPAP.